MAR 25: VESPERS WITH DIVINE LITURGY – 6:30 PM. 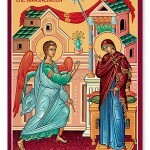 On March 25th we celebrate the Annunication of the Theotokos. The feast commemorates the announcement by the Archangel Gabriel to the Virgin Mary that she would become the Theotokos (God-bearer) as told by the Gospel reading in Luke 1:24-38. In the reading, the Archangel Gabriel appeared to the Virgin Mary, who was living in Nazareth, and said to her, “Hail, O favored one, the Lord is with you.” Mary was perplexed and wondered what kind of greeting this was. The angel told her not to be afraid, for she had found favor with God. He said, “You will conceive in your womb and bear a son, and you shall call his name Jesus. He will be great and will be called the Son of the Most High; and the Lord God will give to him the throne of his father David, and he will reign over the house of Jacob forever; and of his kingdom there will be no end.” Mary responded to the angel by asking how this could happen since she had no husband. 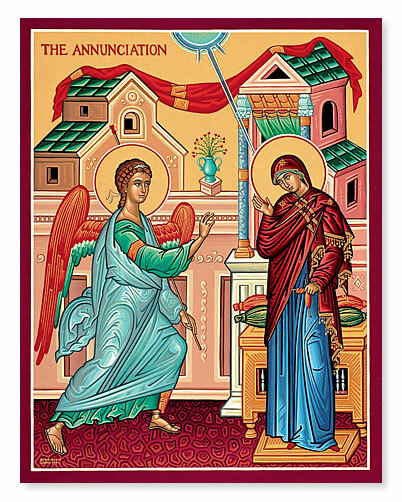 The angel told her the Holy Spirit and the power of God would come upon her, and the child to be born of her would be called holy, the “Son of God.” This announcement proclaimed her Theotokos (God-bearer). The angel then proceeded to tell the Virgin Mary her cousin Elizabeth had conceived a son in her old age (John the Baptist), and affirmed that with God nothing is impossible. In faith and obedience to the will of God, Mary replied to the angel, “Behold, I am the handmaid of the Lord; let it be according to your word.” Upon her response, the angel departed.